Amazon has just dropped the price on a 6-count pack of Enjoy Life Semi Sweet Chocolate Mini Chips to $19.32 with free Prime/SuperSaver shipping, which comes to $3.22 per 10 oz. bag with free Prime/SuperSaver shipping, which is a heckuva lot cheaper than I've ever seen them going for in-store. If you like these chips, I'd recommend snagging them at this price, which won't be around too long. FYI, these mini chocolate chips got 4.7 out of 5 stars over 267 customer reviews (most of which are raves). Soy free, semi sweet chocolate chips. It's the 6PM Motherlode of Deals: 20% off at 6PM on 12/1/14 only. It's the BIGGEST promotion of the year at 6PM: take 20% off sitewide with promo code 6PMCYBMON113020142053. As usual, shipping is free, no minimum. Go forth and shop. This has got to be the cutest KidKraft set yet. 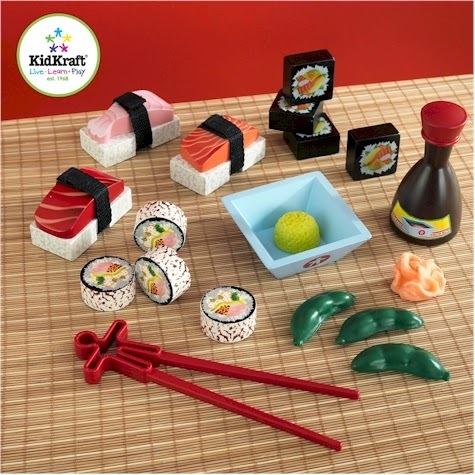 Amazon has just dropped the price on the new KidKraft Sushi Dinner set from $17.36 to $13.29 with free Prime/SuperSaver shipping. This is the lowest recorded price on this KidKraft set. 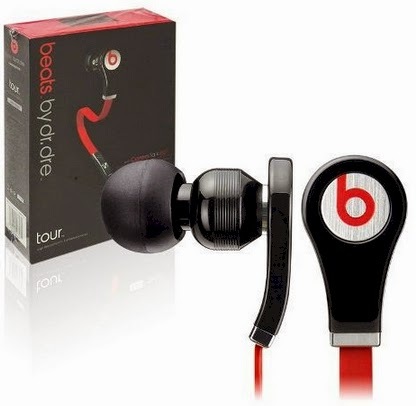 Boardwalk Buy has these Beats by Dr. Dre Beats Tour Earbuds for $32.99, but enter promo code MYCODE10 to drop that price by 10% to $29.69 + $3.45 shipping = $33.14 shipped. Buy one pair of shoes at Crocs.com, get up to two more pairs at 50% off when you enter promo code BRIGHT at checkout. AND don't forget to visit their Black Friday Doorbusters page. The Doorbusters are excluded from any other discounts. Free shipping with a $24.99 minimum purchase. LAST CHANCE TODAY: Take 30% off any book on Amazon (discount up to $10) with promo code. Yup, an actual, real, printed BOOK. Don't miss out! Today is your last chance to take advantage of one of the best Black Friday offers on Amazon! Don't miss this one. 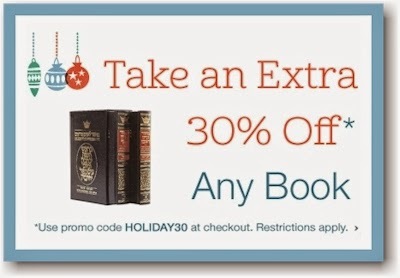 This is one of Amazon's BEST Black Friday offers: take 30% off any printed book on Amazon.com when you enter promo code HOLIDAY30 at checkout. Your promotional credit limit is $10, (which is about 30% off a $33 book). While this promo code is not supposed to be combined with any offers, I noticed that it does stack with those $1 promotional slower-shipping credits that you might have been collecting. If you're interested in Jewish books, you can check out the Artscroll titles over here, or maybe score $10 off a machzor set here (yes, this code works on sets as well, as long as they have a single Amazon listing). I was checking out the Stone Edition of the Chumash box set here or the single volume Stone Chumash here. If you'd like to get a keeper for your kids, there's the Harry Potter Paperback Box Set. All my fellow co-bloggers are suggesting classic kosher cookbooks as great options. There are always coffee table books to consider. You can get an interesting reference book. Every home should own the Oxford English Dictionary. Send me your suggestions and I'll happily post them so that we can share them with the rest of the class. I think it's important to get a book that you will want/need/read, but I also like the idea of maxing out the benefit of the discount to the full $10, so I would aim for a book that costs $33.34 or more. Make sure it's a book sold by Amazon (you can filter for it by checking off Prime shipping in the options on the left side). So which book do you think you'll cash in your 30% discount for? Today is your last chance to take advantage of these incredible prices. If you've already got this magazines, make sure you lock in these prices for your renewals! 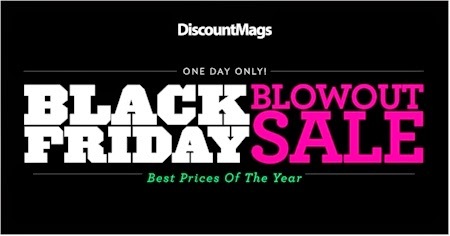 These are, hands-down, some of the best deals that DiscountMags has ever offered on these magazine subscriptions, in their Black Friday Blowout Sale. Remember, these prices are good on new subscriptions, renewals, and gift subscriptions, and there is never any auto-renewal on DiscountMags. This year, they are also selling "bundles" which enable you to get two magazines that you like for slightly less than what you would have paid if you had purchased them each separately. World of Judaica just released a pre-CyberMonday 20% off sitewide promo code: CYBERMONDAY14. They are a Daily Cheapskate Favorite Vendor and have got some near-wholesale pricing on Judaica and Judaica supplies, free shipping on most of their items, and with this limited-time 20% off promo code, you'll make out like a Chanukah bandit. In addition to their beautiful Judaica, they also have a lot of Jewish- and Israeli-oriented children's toys as well. These ship from Israel, so make sure you order now to get it in time for Chanukah. I've been asked by several readers to post this deal again, because some of you are having a hard time finding it, and happily, it's still out there and still at a fantastic price! Amazon has got this Crazy Girls long sleeve midi BodyCon dress for $6.45-$50.00. A quick perusal of some size/color combinations tells me that most of these are priced at around $10.00-$15.00 shipped. Comes in 17 colors and it's approximately 42.5 inches long. The black one is priced from $12.29-$16.99, depending on which size you purchase. This Bodycon dress can work as a "layering dress shell," which normally cost quite a bit more (check out this one, this one, this one and this one), plus here you will have much more of a selection of colors and sizes, and most come with free shipping or free Prime/SuperSaver shipping. A layering dress shell brings almost any dress up to higher modesty standards, and opens up a world of fashion to those who want to cover up but still dress stylishly. UPDATE: One reader commented that the dress ran a little small. You do want it to be a little snug so that it will fit comfortably under your outer layer clothing, but you don't want it to be too tight, so you might want to order one size up. Think about the way you like your shells to fit, and then order accordingly. Redbox has got a new 12 Days of Deals promotion out. Text NICE to 727272 daily for Redbox surprises—(even possibly a movie night a week for a year). Details are here and promotion runs through 12/10/14. Waterford is having a Black Friday sale with huge savings on select crystal patterns and free shipping on orders of $39 or more. 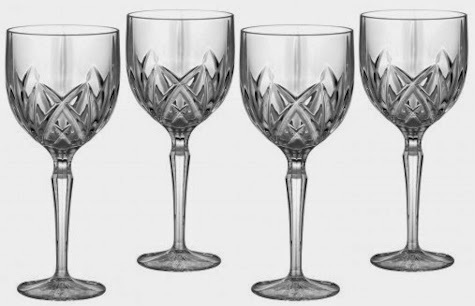 The set of four Waterford Brookside wine glasses pictured above or the Waterford Brookside Iced Beverage glasses pictured below are each $39.99 with free shipping, which comes out to $10 per Waterford glass! There are other Waterford crystal selections that are priced the same included in the Black Friday promotion. 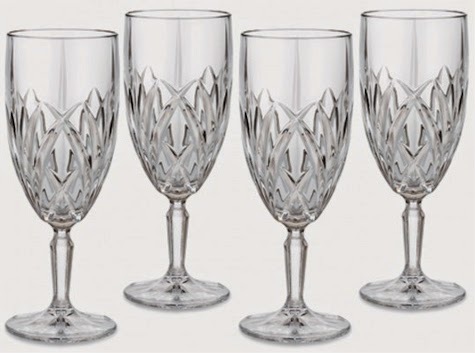 If you've got a child about to get or recently married or have always wanted high-end Waterford crystal for yourself, this is a great opportunity to upgrade your tableware at a fantastic price. We live in a small house, so I've come to love storage that doesn't look like storage. 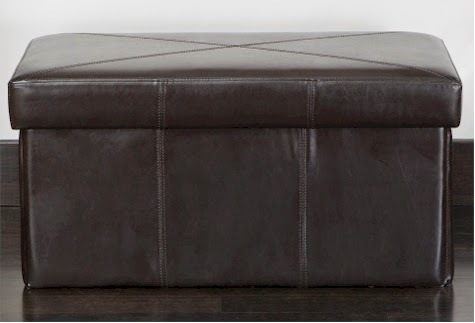 Hayneedle has this Nottingham Leather Folding Storage Ottoman Bench in brown for $68.90 with free shipping, but that price drops by 12% with promo code CMSALE to $60.63. 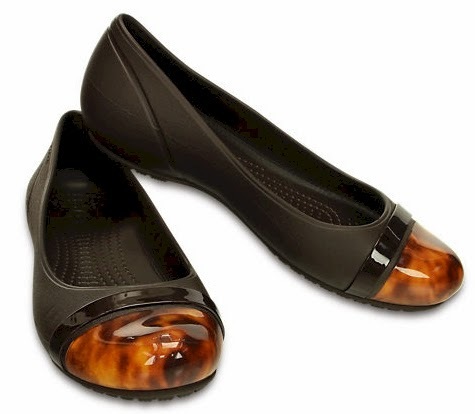 It's also available in black for $71.39 $62.82 with free shipping after the promo code. Dimensions: 31L x 16W x 17H in. One of Amazon's Gold Box Deal of the Day is up to 50% off Kids' Indoor Tents from Playhut, starting at $9.99 with Prime/SuperSaver shipping. 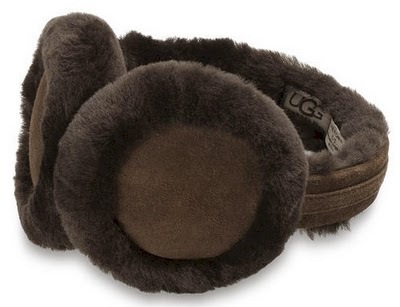 Amazon has got these UGG Australia Women's Double U Logo Shearling Earmuffs in chocolate and gray for $54.95 with free shipping. I haven't seen them at a lower price on any other website. Amazon has the highly-rated Just Like Home Play Microwave for $21.46 with free Prime/SuperSaver shipping. 4.3 out 5 stars over 59 customer reviews. 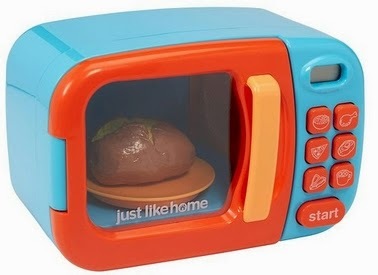 Description: The "Just Like Home" microwave oven has lights and sounds like a real microwave. Close the door, select the "food" you would like to "cook", press the start button and the inside light will come on and the turntable will spin. An electric timer counts down the time and beeps when the food is done. Just Like Home! 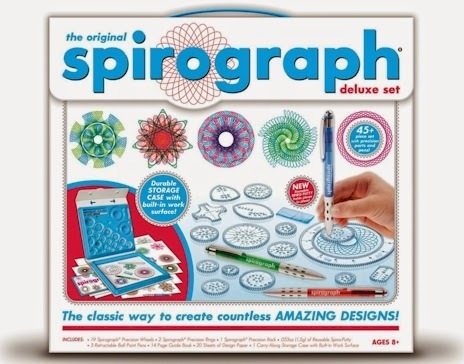 Amazon has got the Original Spirograph Deluxe Set for only $9.99 with free Prime/SuperSaver shipping, the lowest recorded Amazon price ever. 4.3 out of 5 stars over 638 customer reviews. 10% on Target gift cards, available online NOW!